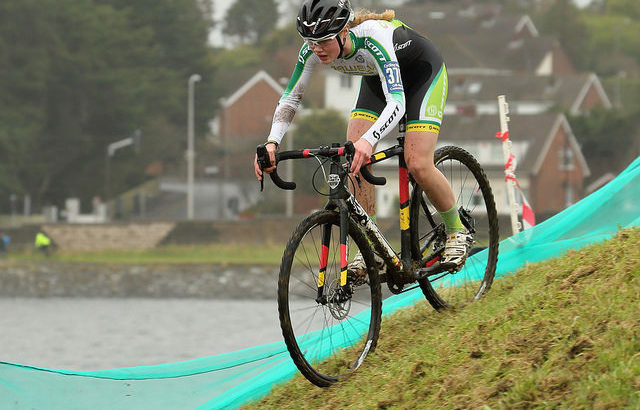 Annie Roche won the Under 14 Youth National Cycle-cross Championships on Sunday (Jan 28th). She finished well clear of her nearest rivals in the Under 14 girls’ race. “On the Sunday 28th of January the day we were all waiting on , finally came around it was cyclocross nationals. The weather was calm dry but had a bit of a cross wind. The course was fun and enjoyable with some tricky off chamber sections and some steps with hills. It was around the reservoir in knock bracken reservoir Carry duff. I was really looking forward to racing on Sunday but I was a bit nervous because I knew I had though competition. In the morning I was feeling good and ready to race , but the nerves kicked in When it started to get close to race time. It was time to go to the line I had, had a good warm up and was ready to go. They called us to the start line. First the U16 girls went then 10 seconds later the U14 girls went. I had a good start I stayed up there with Erin Hannah and Aoife – then Aoife fell on the off camber … so did Hannah , so I went around the outside of them and caught back up with Erin. Erin and I kept going, at that stage we had a good few meters on the chasers . I was feeling strong – so I felt like I could push on that bit more , so I did and took over from Erin. Erin stayed on my wheel until the hill after the off camber section so I kept pushing on and saying to myself “I can do this” I had caught up with some of the girls from the U16 race so that gave me more confidence to keep going. My mam and all the supporters kept me making wanting to push on so the girls won’t catch me. I kinda thought It was a catch game at one point. By the last lap I was hoping that everything would keep working , and thank god I had no mechanical problems. I came over the line with a big smile on my face knowing that I was U14 girls National Cyclocross Champion for 2018. In the end I was the 3rd girl over the line , and the 1st U14 in . It was a brilliant experience and I hope to do some more work next year”.